Having endured a disappointing quarter-final exit at the World Cup Stage I in Shanghai, Kumari showed why she's a former world no.1 by making amends in the second stage. 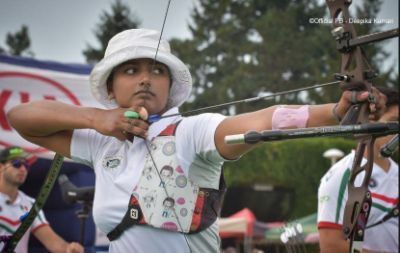 Kumari was back to her consistent best as she shot 34 perfect 10s to total 672, to take the top spot in the qualification round. The total was five points more than Taipei's Peng Chia-Mao who finished second. The performance is guaranteed to do Kumari's confidence a world of good going into the next round. However, apart from Kumari’s exceptional display, it was a disappointing day for India at the event as Deepika's teammates Monika Saren and Preeti finished 31st and 45th respectively as the team ranked fifth in the draw of 16. Meanwhile, in the men’s recurve category, Dhaniram Basumatary finished highest at seventh with 667 points, two points ahead of Olympian Atanu Das who finished 13th. Finally, the third Indian Indrachand Swami finished 25th as the team bagged the third place in the qualification ranking.